Wethersfield resident Patrice Gilbert knew that compact fluorescent bulbs contained mercury, so as they burned out, she put them aside until she could find out where to properly dispose of them. Gilbert’s action is typical. Nationally, only an estimated 2 percent of household CFLs are recycled properly, the Association of Lighting and Mercury Recyclers says. 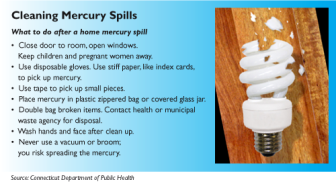 In Connecticut, only 4 percent of households participate in hazardous waste collection days – where mercury-containing CFLs, thermostats and thermometers should be recycled. Instead, those items usually end up in one of the state’s trash-to-energy plants, where, through the disposal process, mercury gas is emitted into the air and eventually pollutes waterways and ends up in fish. While 40 percent of mercury pollution in Connecticut comes from out-of-state sources such as Midwestern coal-fired plants, volcanoes and other sources of pollution, 60 percent comes from in-state sources – primarily the state’s six trash-to-energy plants and its one coal-fired plant. The state Department of Energy and Environmental Protection has worked to curb mercury in the air and water by implementing tighter emissions restrictions, banning the manufacture and sale of most mercury-added products and encouraging proper recycling. But unhealthy mercury levels (more than 0.2 parts per million) in most fish persist, resulting in restrictions on local fish consumption. Mercury remains a “significant, persistent, [and] complex problem,” said Robert Kaliszewski, director of planning and program development with DEEP. Exposure to mercury, through the air or by eating mercury-laden fish, is toxic to humans. Mercury can attack the central nervous system and damage the brain, heart, lungs, kidneys and immune system. Developing fetuses and small children are especially susceptible, and mercury can cause neurological and developmental damage. Based upon blood sampling data, federal scientists estimated that between 300,000 and 630,000 infants are born in the United States each year with mercury levels that are associated, at later ages, with the loss of IQ, according to a report published by Environmental Health Perspectives. Research attributed this to pregnant women’s consumption of mercury-contaminated fish. A University of Connecticut study of fish found that in 22 lakes tested statewide where year-over-year comparisons were done, the overall mercury concentration declined by 17 percent, from 0.41 parts per million in 1995 to 0.34 parts per million in 2005-06, the most-recent data available. Some lakes, such as Powers Lake in East Lyme and Amos Lake in Preston, showed marked improvements. But the fish in seven waterways, including Bashan Lake in East Haddam, Beach Pond in Voluntown, and Lake Saltonstall in Branford, contained increased levels of mercury, the study by UConn Professor Christopher Perkins showed. Fish readings from 51 lakes, ponds or reservoirs sampled in 2005-06 explain why the statewide fish advisories persist: scientists tested about 10 fish per waterbody and in 50 waterbodies, at least one fish tested exceeded mercury levels of 0.2 parts per million. Only the fish tested in Cedar Swamp Pond in Bristol contained mercury levels below 0.2 ppm. In eight waterbodies, at least 70 percent of the fish sampled contained toxic mercury levels of at least 0.5 parts per million, the study showed. Those waterways are: Bashan Lake, Beach Pond, Mansfield Hollow Reservoir in Mansfield and Windham, Mashapaug Lake in Union, Moodus Reservoir in East Haddam, Quinebaug Lake in Killingly, Uncas Lake in Lyme and Wyassup Lake in North Stonington. While the UConn study done on behalf of the DEEP doesn’t test the fish in rivers and streams, the state Department of Public Health declared a fish consumption advisory for all the state’s waters. Since much of the mercury contamination comes from the air, officials know that if it’s in the lakes, it’s in the rivers, said state DPH Epidemiologist Brian Toal. “There is mercury in all fish, everywhere in the world,” he said. There is even mercury in trout, but trout under a foot long has few restrictions because it’s raised in state hatcheries. Mercury reductions in local freshwater fish are due, in part, to the New England governors’ commitment to a “virtual elimination goal for mercury” made in 1998. 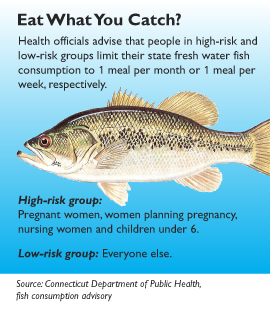 With fishing season here, people who get their fishing licenses receive the state DPH advisories on eating fish caught in Connecticut waters. But multiple studies report that those with fish as a dietary staple and subsistence fishermen eat the fish they catch far more frequently than the health advisories of once a month for pregnant and nursing women and small children and once a week for adults. “Lower income people are affected a lot worse,” by mercury in the fish, said Dr. Mark Mitchell, co-chair of the Environmental Health Task Force for the National Medical Association, who researched people fishing in the Connecticut River. “When I asked Latinos, African Americans, Asians – they all said they ate the fish. Nobody threw the fish back,” Mitchell said. He found that the sustenance fishermen were unaware that they were required to get a license to fish in public waters. The state posts fish-consumption warning signs in multiple languages on trees near fishing spots, but state Rep. Mary Mushinsky, D-Wallingford, says the signs don’t work. The state health department has the equivalent of a full-time person working with nonprofits and religious institutions that serve low-income people to educate them about fish-consumption restrictions. In 2007, the state worked with other Northeastern states to persuade the EPA to reduce allowable mercury emissions. For the three most recent years available, 2012, 2011 and 2010, the total amount of mercury emitted from waste and coal-fired facilities combined was statistically unchanged, at 47, 51 and 49 pounds of mercury emitted respectively on an annual basis, according to state DEEP figures. These outputs meet the allowable mercury emissions standards. One significant reduction has come from the state’s only coal-fired plant because its hours of operation have been cut as suppliers turn to cheaper sources of energy. In 2012, the coal-fired PSEG Power Bridgeport Harbor Station, operating a total of 561 hours, emitted 0.33 pounds of mercury while the state’s trash-to-energy plants collectively emitted 48.52 pounds of mercury, DEEP figures show. That’s enough mercury to contaminate 28.8 million fish, according to Professor Robert Mason of the marine sciences and chemistry department, at UConn’s Avery Point campus in Groton. The DEEP is working with other states to follow Europe’s lead in product stewardship, which puts the responsibility for end-of-life disposal or recycling on a product’s manufacturer. “We are continuing to improve the separation of mercury containing products from the trash. We are looking to increase the recycling of mercury containing products,” said Diane W. Duva, assistant division director, waste engineering and enforcement division. For example, electronics contain a small amount of mercury, as well as other harmful materials, and the state now requires manufacturers to pay for recycling them. Environmental mercury levels could be reduced further if residents and businesses recycled products containing mercury, said DEEP’s Rose. Most municipalities offer hazardous waste collection days, either in their own community or at a regional location, but most residents do not take advantage of the programs. The state’s businesses are required to recycle mercury-containing products such as fluorescent lights, CFLs and thermostats, but households are not mandated to do so, only encouraged. As of July 1, 2014 businesses and stores that sell thermostats must provide a way for their customers to recycle the old ones. To find the state public health fish consumption advisories, click here. Stores in Connecticut that recycle CFLs are: IKEA, Home Depot and Lowe’s.